This is a presentation of all the Genesis camera menu pages that allows you to simulate navigating between each page with a web browser. We simulate moving between the 55 menu pages, but we do NOT simulate moving around the hundreds of items inside the pages. For each navigational control, you can either click the image or the text above it. (The image below is an example, clicking does nothing). Cancel moves you towards the TOP menu. 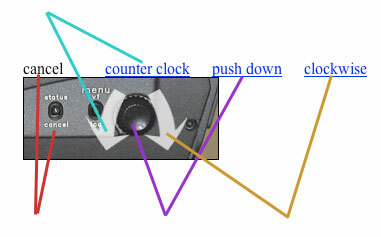 Turning thumbwheel counter-clockwise moves you backwards to previous item or page. Push down selects the item. Turning thumbwheel clockwise moves you forward to next item or page. There will also be occasional blue underlined links. Clicking on those will take you to a page. Ready?